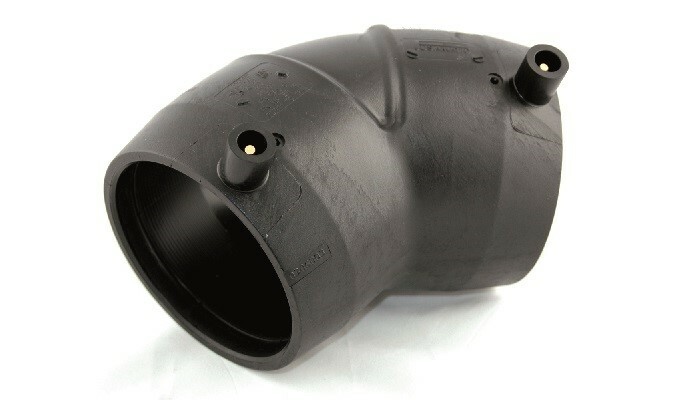 A 45⁰ electrofusion elbow is used to join two lengths of poly pipe on an angle of 45 degrees. 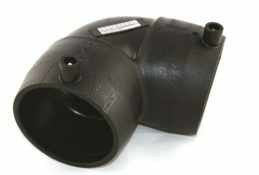 Electrofusion elbow 45⁰ fittings are also used to join a long spigot fitting to a piece of pipe on a 45⁰ angle. 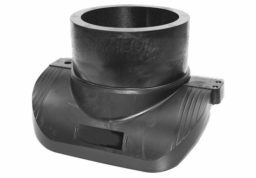 With a size range from 32 mm to 180 mm, 45⁰ electrofusion elbow fittings come in SDR 11, SDR 13.6 & SDR 17. Electrofusion 45⁰ elbows are rated to PN16 water and 1000 kPa gas. 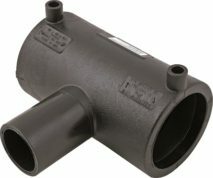 Electrofusion elbow fittings are made from PE100 material with a precisely moulded energising coil of wire, ensuring uniform melting for a strong electrofusion joint and the minimisation of welding and cooling times. 45⁰ elbow electrofusion fittings are suitable for use for HDPE pipe, and welded with an electrofusion pressure welder. 45⁰ electrofusion elbow PE fittings may also be known as an electrofusion elbow joiners or EF elbow pipe joiners. 32 mm electrofusion 45⁰ bend (2104.0032) 45⁰ EF elbow fitting. 40 mm electrofusion 45⁰ bend (2104.0040) 45⁰ EF elbow fitting. 50 mm electrofusion 45⁰ bend (2104.0050) 45⁰ EF elbow fitting. 63 mm electrofusion 45⁰ bend (2104.0063) 45⁰ EF elbow fitting. 75 mm electrofusion 45⁰ bend (2104.0075) 45⁰ EF elbow fitting. 90 mm electrofusion 45⁰ bend (2104.0090) 45⁰ EF elbow fitting. 110 mm electrofusion 45⁰ bend (2104.0110) 45⁰ EF elbow fitting. 125 mm electrofusion 45⁰ bend (2104.0125) 45⁰ EF elbow fitting. 160 mm electrofusion 45⁰ bend (2104.0160) 45⁰ EF elbow fitting. 180 mm electrofusion 45⁰ bend (2104.0180) 45⁰ EF elbow fitting.